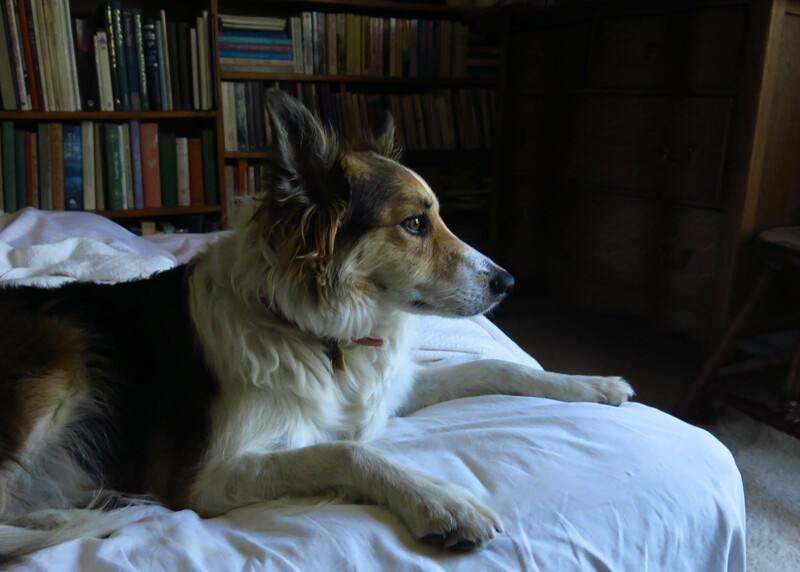 Greetings and salutations, everyone; yes, once again it is I, your popular host, Mani the purebred border collie, here today to talk about some things rather different from the usual stuff. You may remember me from such posts as “Good Things And Bad”, among so many, many others. Here I am in a characteristic pose. I was thinking of taken a nap on the soft Pottery Barn sheets, on this quiet afternoon, but I heard a hawk crying, and so I went downstairs to check it out, but couldn’t see anything. It is, in fact, a quiet afternoon, with those little moments of almost complete calm like the guy I live with thought he would have when he retired…but it didn’t turn out that way. The moments of calm are still very pleasant, especially after the frightening weather of last week. For a few days last week we were under a tornado watch, though the guy I live with didn’t say anything about that; he just kept it to himself. Never mind that those things rarely happen so close to the mountains. They can still happen here. There were tornadoes all over the place northeast and east of us. Even though they were well over a hundred miles away, and not huge ones, the guy I live with still thought they were scary. Since it’s the last day of July, the guy I live with went shopping and brought these home. He said he used to give them to Slipper when he was sick, but that I didn’t need any. 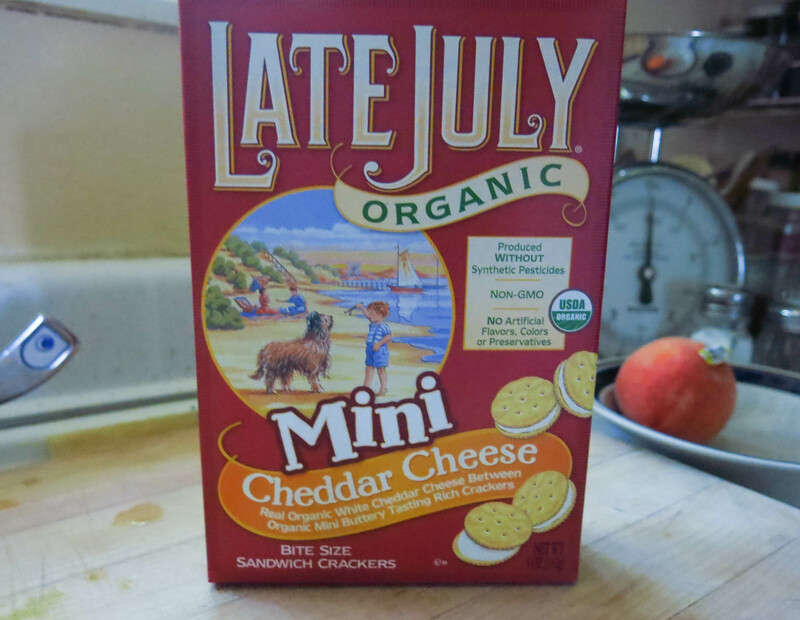 (Because once the box was opened all the crackers had to be consumed. It’s like a rule or something.) He also brought this home because he said “you never know”. 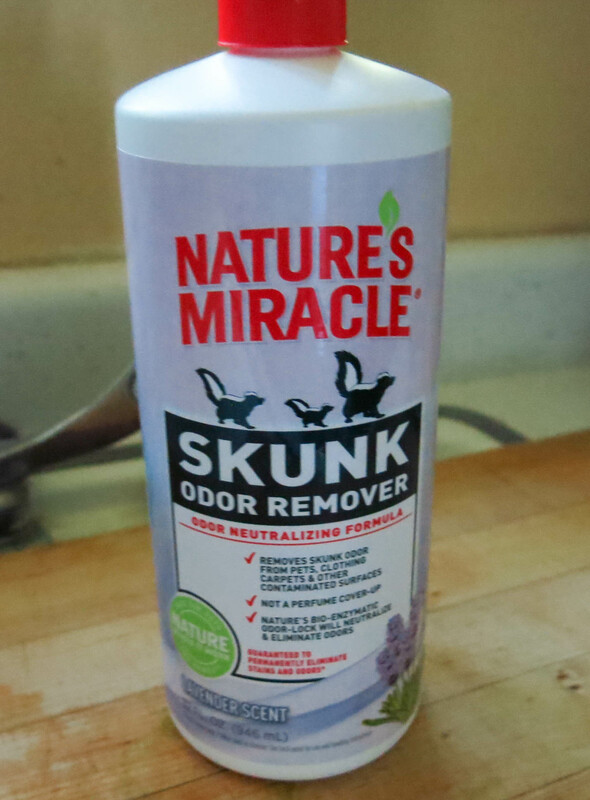 He talked to a “skunk guy” (really, a guy who used to relocate wild animals) who said this worked the best. So now I have this story to tell. It’s kind of long. I didn’t write that post, but it’s still okay. The story I have to tell is a totally true story, and kind of astonishing. I’ll try to tell it in the most dramatic and interesting way possible. A few weeks ago there was a knock on the door, and it was a young deputy sheriff. The deputy said the guy I live with wasn’t in trouble, and handed him a thick sheaf of papers. He looked at them, knew what the papers were, because he had gotten some earlier and responding had slipped his mind (he’s ancient). He told the deputy that he had to hear this story before the got to the sidewalk. It was a request from the U.S. Army for a sample of mitochondrial DNA so that the remains of his mom’s cousin, Hudson Upham, who was piloting a B-17 which crashed near the summit of Mont Blanc in November 1946, could be identified so that all the crew members could be buried in separate graves in Arlington National Cemetery. There’s stuff on the internet about this. The guy I live with told the deputy that his mom, who is the only surviving person who remembers Hudson (he taught her to do a dance called “the jitterbug”), would give the DNA sample since that only seemed right. That was a story the guy I live with had heard since he was very little. The retreating glaciers on Mont Blanc exposed the plane and the remains. Now back to the Neccos. The guy I live with loved to go to his grandparents’ house in Los Angeles, as a kid, to the house on Oakwood Avenue. He would work and play in the garden, spend time in the house, with all its little secret places, smelling of books and old Army things, and full of artifacts from Asia, because his grandfather was stationed in the Pacific before the war, and during the war. The neighborhood was old; houses built before the First World War, up and down tree-lined streets. That’s all changed now. Sometimes he would walk down the street with his grandfather to the liquor store, to get a newspaper, on Western Avenue. The liquor store smelled of candy, at the cash register, and that’s where the Neccos were purchased. The guy I live with would walk back home with his grandfather, eating Neccos, which he really liked and always associated with his grandfather–even now–while his grandfather smoked a cigar, sometimes. The smell of cigars makes the guy I live with think of summer evenings in Los Angeles. Just like the powdery surface of a Necco, and particularly the taste of the licorice ones (the best ones) makes him think of his grandparents and the Uphams. The house was owned by two sisters; one his grandmother, and one, his great-aunt. Hudson was his great aunt’s youngest son. There was another brother, Frank, whom the guy I live with knew pretty well. He was in the Navy, on the USS Essex, in the Second World War. He was commander of the air group. The planes. He retired commanding the naval station at Corpus Christi, Texas. When he was little, guy I live with once got to go on the aircraft carrier USS Princeton when it was in Long Beach, one time; his “Uncle Frank” was Captain of the aircraft carrier. The guy I live with constantly heard about the Uphams when he was at his grandparents’ house. His grandparents used to talk about them all the time, because his grandfather greatly admired them, so the guy I live with would see images of driving around Los Angeles looking at Christmas lights and think of the Uphams. Of course for everyone involved the previous decade had been anything but Christmas, and now, in the 1950s, the guy I live with’s father was in rehabilitation from being wounded in Korea and no one knew what his future would be. There was a baby grand piano in the house. The guy I live with used to hear stories of the oldest Upham brother, John, who was wounded at Omaha Beach on D-Day, playing the piano there to help regain use of his left arm. One time the guy I live with watched the movie Saving Private Ryan. He’d never seen it before and said I shouldn’t watch. I could hear it, though. They mentioned something about the tanks not getting ashore. The guy I live with called his sister to see if she’d seen the movie and she said she had, and so he told her that the 741st Tank Battalion didn’t get its tanks ashore, but that the 743rd did, and that it was commanded by John S. Upham, Jr., who was seriously wounded that day. The guy I live with’s great-aunt and her husband, John Sr. (also in the military) lived in the house earlier, and one time the guy I live with went to his grandparents’ house and his grandfather was busy with a trowel, uncovering some bricks in the grass. They were part of a line of brick stepping-stones which had been laid down maybe in the 1930s. The garden was old by the time the guy I live with first experienced it. The shed had been a garage for a Model A Ford, and had been moved into a corner of the yard, by the “way back” there. The guy I live with loved playing in the shed, though going into the back of it, where stuff had been piled for years, was a bit too scary. But the sight of a line of newly uncovered brick stepping-stones, laid down long before he was born, by people he had only heard of, was one of the most magical experiences of his childhood. Maybe that’s why he took up gardening. Lovely family story, and you told it very well. If Nature’s Miracle doesn’t work for you (if you ever need it that is! ), try Skout’s Honor. Neccos were the best… but they changed them to more “healthy” ingredients (aka beet juice for red instead of dye, etc) and now some of them are nasty to me! I think you deserve a little cheese cracker or two! To keep hearing how the other purebred Border collies used to get this or that must be very hard for you. You’re a very sensitive soul. The guy I live with says thanks for the tip and we hope we never have to try the Nature’s Miracle. He won’t be eating Neccos any time soon. There was a tiny roll of them in the drawer here, a stocking stuffer type thing, which he kept for years, but eventually tossed. 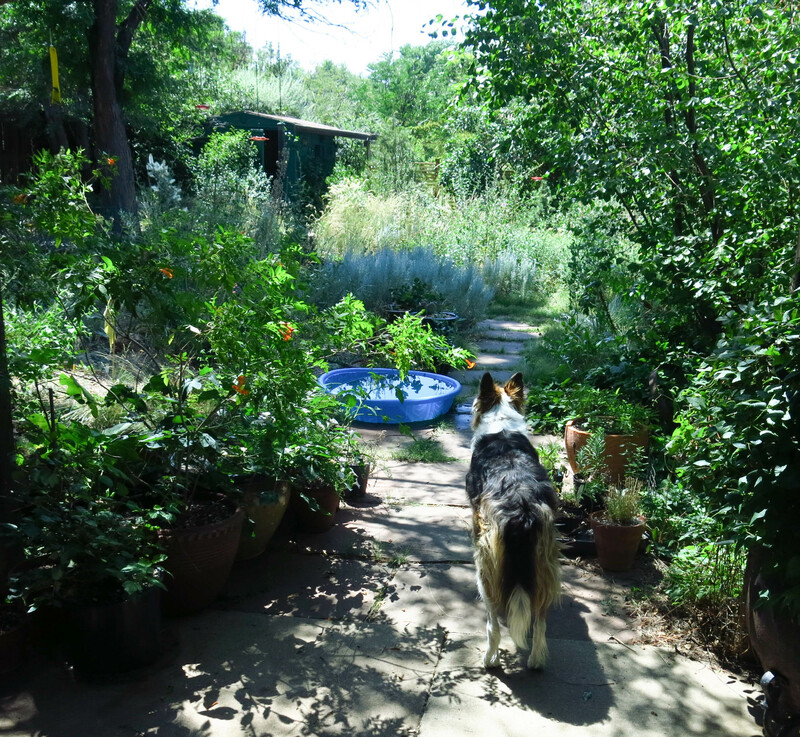 It’s really okay that I don’t get all those things because the other purebred border collies who lived here didn’t get the food I get, and they certainly didn’t get the treats I get. It is unfortunately that families do not stay in their ancestral homes for more than one generation. Most families move a few times within just one generation. I guess. The house in question was built in 1912 and demolished some time in the 1980s. Nothing is permanent. When the guy I live with’s wife died, some people said he should move, which obviously he didn’t, and also obviously, we wouldn’t have met. So it was a good thing that he stayed. Oh, that is even worse! I thought that the house was still there. I looked it up on Google maps because it is close to where I sometimes work when I go to the region. The guy I live with said that if you do a “street view” of 331 N. Western Ave Los Angeles CA you will see a corner building that says “dry cleaning”. It used to be a place where they made chocolates. Then if you go down Western, and then west on Beverly, there’s Schaefer Ambulance, which was there when the guy I live with was a kid (in fact it backed up against a corner of his grandparents’ house), smaller of course and different building, and then, The Dover, which looks exactly the same as it did, looming over the shed in his grandparents’ back yard, in the 1950s. Well, that’s what I mean. There is one house there with a chain link fence around it and a white minivan in the yard. I thought that was the house. That was the house next door. The guy I live with said he first saw cucumbers growing on vines on the fence there. The couple who lived there were older; he was bedridden and one time he got a 7-Up bar, which he didn’t care for. She was a medical doctor and a “socialist”, who had furious political arguments with his grandfather, also a medical doctor. But it’s okay that it’s all gone. He said sometimes he has dreams where he and his wife inherit the house and everything is wonderful, and then he wakes up to his real life. My great grandmother who was in kindergarten during the Great Earthquake remember way more about the history of the region than I would want to know. I would think that it would be sickening to see how the Santa Clara Valley changed. Yet, she was so optimistic about it. She thought that it was so nice that a million other people get to enjoy the region that she enjoyed so much. Wow! I wish I could think like that! Same here. The Denver area has expanded like crazy, and now there are all these restaurants, etc. which were unheard-of in the 1960s. Some of my ancestors who were not here happened to have been in Louisville. There is a museum there in the old Tomeo House. Some of the artifacts from my grandparents’ home were sent there. My great grandparents were there a few times, as well as in Aspen. They remember Louisville as a small town outside of Denver. It’s a biggish town pretty much in Denver, now. Thanks for the story, Mani. I have a friend who is taking a memoir writing class to be better able to get her memories down on paper. Maybe she also needs a blog like you have, to have an audience for what she writes. Your story-telling skills are well-honed! Thanks. Well, the guy I live with does have what’s called “superior autobiographical memory”, and sometimes very little things will trigger a flood of memories. Interesting. Well, the guy I live with has a sweet tooth, for sure, but these days he can’t handle much sugar.